Last week we visited the Jewish Historical Museum in Amsterdam. They have nineteen Hungarian Avant-Garde artists in From Fauvism to Surrealism: Jewish Avant-Garde Artists from Hungary. We were there at the end of a busy day, and I was tired, so I did not absorb information with my usual gusto. 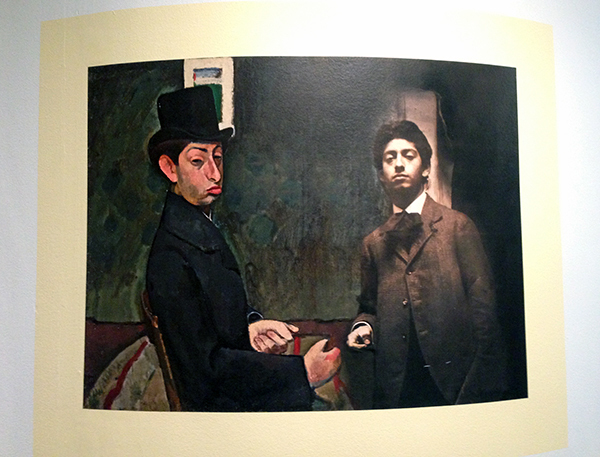 But managed to admire the image below, which is a compilaton of a self-portrait by Róbert Berêny (Self-portrait with Top Hat, 1907) and a photo of same Róbert. I liked the seamlessness. For the rest, the museum should re-think its lighting and colour-scheme strategy, which could have been much better.